A view of Bedford Middle School, which is located at 88 North Avenue. 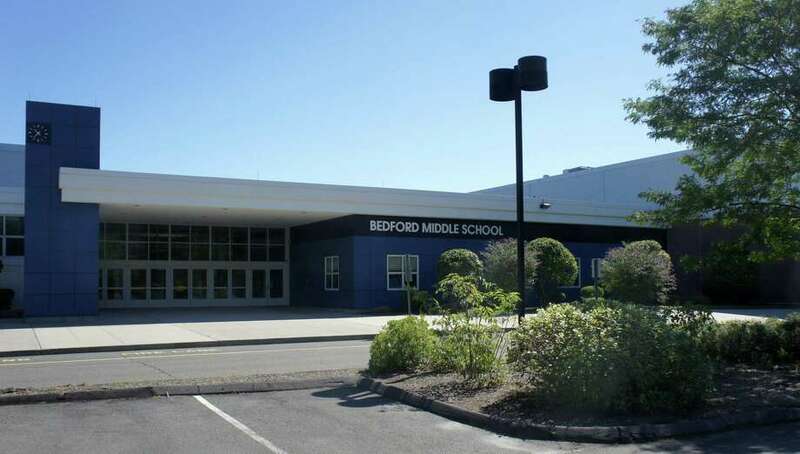 WESTPORT — The Board of Education voted 7-0 to fast-track the purchase of six portables for Bedford Middle School next year. The alternative was to seek state funding for the $1 million plan, which would have slowed the process of obtaining the facilities to help house all the town’s middle schoolers following Coleytown’s closure. The fast-track will allow the portables to arrive in July as opposed to mid-August, BOE Chair Mark Mathias said. “Time is of the essence,” Chief Financial Officer Elio Longo said, noting he has learned in conversations with portable vendors that several communities are placing orders for modular classrooms now for summer deliveries. The BOE also discussed the newly formed Coleytown Middle School Building Committee, charged with fixing the school. Town Public Works Department Director Peter Ratkiewich presented a timeline of the Coleytown rehabilitation, which he said should be complete in July 2020 in preparation for the 2020 school year. Ratkiewich said the town will hire a project manager to oversee the rehabilitation, and the project will encompass urgent repairs and replacements. This may not include a complete replacement of all the building’s windows because of the tight July 2020 timeline. Several parents expressed frustration about the contingent rehab plan, saying they fear the fixes may not be enough to make the school healthy for students — especially since the leaky windows are part of what caused mold to grow in the school. “This feels like a really fast, cheap, crummy job,” Coleytown Parent Teacher Association President Lee Goldstein said, adding the plan resembles the interim repair projects to the school prior to its September shutdown. “This is not intended to be a remodel of the building. We need to be clear about that. ... This is really more a refurbishing that at least, from what I understand, is a refurbishing to the way it was back in August before it started getting he mold incursion,” Mathias said. Second Selectman Jen Tooker said the building committee and town will be in contact with parents to discuss their concerns about the Coleytown rehabilitation project. “We have an obligation to communicate differently through this project. I don’t know exactly what that looks like, but we will,” Tooker said. Rough estimates on the rehab are between $10 million and $20 million, Ratkiewich said.